Alas, this topic is becoming a series. Unemployment is over 8 percent. Nearly 60 percent of Americans, according to a new poll, believe the country is on the wrong track. The number of people on food stamps is at a historic high and the median net worth of American families is at a 20-year low. 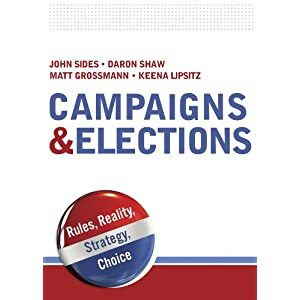 If it was true that winning elections is mostly a matter of numbers — as some political scientists and campaign operatives like to argue — Barack Obama’s reelection as president should be close to a mathematical impossibility. For much of this presidential election cycle, Republicans were counting on precisely this. But 2012 is proving that politics isn’t just about numbers, and some traditional leading indicators look as if they are losing their predictive power. In recent times, the incumbent party will, on average, lose with such a low growth rate in the second half of the cycle. Why do I care about this? Well, I want to question the idea that the economy is helping (or at least not hurting) Obama. I want to question the assertion that campaigns don’t matter because the economy is everything. The economy is in fact worse for Obama than the new very recent conventional wisdom has been suggesting. First, I wish Martin had at least quoted some political science or some forecasting model or something. Anything, really. Because otherwise the evidence for this assertion is terribly lacking. Second, to say that the economy might be slightly or somewhat favorable for Obama is not to that “campaigns don’t matter because the economy is everything.” That’s not what most political scientists think. I’ve said this many times. Here’s one link. Third, on the empirics. Grier’s analysis takes one statistic (GDP growth) and looks at one time period (last two years of the term), and compares winners and losers. There’s nothing unusual about this approach. My own foray into forecasting also looks at GDP growth and a somewhat arbitrarily defined time period (first two quarters of the election year). There is heuristic value in doing this and some theoretical basis too—GDP is a good overarching measure of the economy, more recent trends in the economy matter more than earlier trends. Typically, these decisions do not matter a huge deal, since by the election year most economic indicators are pointing in the same direction. Another comprehensive approach is that of Robert Erikson and Christopher Wlezien, whose forecast model is based on the index of leading economic indicators (weighted so that more recent growth counts more heavily) plus the polls. Their forecast, summarized here, is that Obama wins with about 52-53% of the vote. I asked Wlezien what would happen if they did a forecast based only on the index of economic indicators, and not the polls, and he reported that they would get a similar result. Now, there is reason to believe that Obama is not going to get 52 or 53% of the two-party vote. But I think a broader review of the evidence suggests that the economy is, on balance, slightly favorable for him. Certainly it does not make his reelection a “mathematical impossibility.” Neither does it make him a shoe-in. Which is why the campaign matters. ummm, Mike Munger didn’t write that. Hmm, I wonder what Niall Ferguson has to say on this. He’s an expert on elections and the economy. Angus: NOW you’re going to start? I’ve been putting my name on your work since that JLR paper in 1986, bub! Angus, Michael: Many apologies. This is now fixed with an appropriate erratum at bottom. Thanks John: very diplomatic of you to leave it unclear exactly who was being insulted! By the way, there are several multivariate models that show Obama losing based on the economy, no? Hibbs for sure and I think I saw a couple others in PS. Obama certainly has endured GDP growth amazingly similar to that of the average 6 incumbent party losers over the last 12 elections. None of what I wrote was meant to deny that in general and on average, holding other relevant factors constant, past economic performance helps to predict presidential elections. Angus: One of the links in the post is to a summary of pretty much all the models. It is true that Hibbs’s is rather pessimistic for Obama, mainly because it relies on disposable income, which has not been growing very fast. Part of the challenge is that most models don’t rely only on the economy but look at other factors too — like presidential approval, incumbency, tracking polls, etc. That’s why I reported in this post on what the Erikson-Wlezien model predicts when the model has only the economic index in there. I wanted to isolate the effect of the economy — as you were trying to do — and their omnibus measure (like Silver’s) suggests that Obama is a slight favorite. We probably agree on more than we disagree here — e.g,. re: role of economy and campaigns in explaining election outcomes. I think the only point of contention is just whether the economy makes Obama the slight favorite or the slight underdog. one reason for all the skepticism is that the economy is still perceived negatively overall. Even Democratic pundits aren’t spinning it especially positively. If the economy “favors Obama” it’s not because voters are happy with the economy, but because the situation has voters giving Obama some credit for some relative improvement and not putting all the blame on him for continued problems. Also, “the economy is killing Obama but he’s personally likable” is true on a literal reading of polls. It’s what the median voter says, at least before the conventions happened. But this is perfectly consistent with the economy slightly favoring Obama, if voters would turn sharply against Obama on both scores in a down economy. Prof. Sides has argued against an economy v. campaigns dichotomy on a number of occasions. But, it deserves noting that he found Obama’s approval to be better than predicted over his term. To the extent that the President fares better than certain important economic indicators like GDP or incomes say he ought to, it predates Romney’s purported weaknesses as a candidate or campaign choices. I’ve been lurking here for a while, having been introduced to the site by some commenters at DailyKos. I must say the discussions here are always quite thoughtful and very interesting, even when they’re snarky.